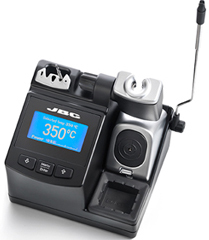 JBC produce high-quality soldering stations, offering three lines to satisfy your electronic soldering and reworking needs. The Compact Line (CD-S, CD-B, CP, CF, CS and CV) features easy-to-use self-contained stations incorporating the very latest JBC technology. The Modular Line utilises JBC's exclusive heating system and combines stackable modules to get your complete personalized soldering set-up. Finally, the Premium Line is ideal for industrial and extensive use and offers extraordinary thermal performance.